The peer-reviewed journal of the Institute of Physics in London, on April 14, 2004, announced that Giulio Fanti and Roberto Maggiolo, both of the University of Padua, Italy, have found a second face image on the back of the Shroud of Turin. This image corresponds to the front image but is much fainter. And this image, like the front image, is completely superficial to the topmost crown fibers of the cloth. Because both images are superficial (meaning there is no image or colorant of any kind between the two image layers on the extreme outer faces of the cloth) and because the images are in registry with each other, all so-far-proposed fakery proposals are moot. The images are not paintings and not some form of medieval proto-photography. Because the images are extremely faint, the duo [Fanti and Maggiolo] has used an array of image-processing techniques -- including Gaussian filters, Fourier transforms and template matching -- to highlight human features. They found that the face of the man that can be seen on the reverse of the Shroud matches that observed on the front. The image shows faint details of a nose, eyes, hair, beard and moustache . . . The Italian duo was also able to make out weak images of the man's hands, but could not produce images of his shoulders or back. These new findings could help to shed light on the origins of the cloth but are more likely to fuel further debate over it. 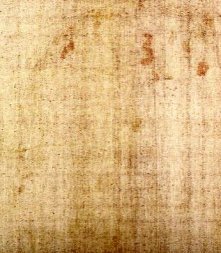 In 1989 (sic 1988), carbon-dating techniques revealed that the Shroud dated from medieval times and therefore could not have been used to bury Christ. However, many scientists have argued that the carbon-dating techniques used to study the Shroud were flawed. Fanti and Maggiolo are now saying that the Shroud is unlikely to be a fraud because the image of the face is superficial on both sides of the cloth and only involves the topmost fibres of the material. "It is extremely difficult to make a fake with these features," says Fanti. While this discover of imaging on the backside of the cloth makes artistic and photographic methods significantly more implausible, it does lend credence to the possibilities that gaseous amines released by the body reacted with the carbohydrate layers. Some gases would have penetrated through the weave of the cloth and reacted with the backside carbohydrate layer. (And it does not rule out miraculous cause or effect).